This has been a week of train trouble for me. And it all started on Monday. I had an interview at Meltsham which is on the way to Gatwick Airport. The trip would mean that I had to change trains at Clapham Junction and board a Southern Trains local to East Croydon, and then catch another local to Meltsham. The train times I had selected had enough time built into them for me to find out where to go, and to get there without a last minute dash. Theoretically. Clapham Junction was the easy part, however, I did not have my camera with me, so some images were taken in January. I managed to grab an earlier local for East Croydon and was soon on my way. Unfortunately Southern Trains is having a lot of bad press lately regarding delayed trains. I had not travelled with them much before so I could not really comment on their punctuality. However, once we reached East Croydon chaos reigned. There was a signalling fault somewhere on the system and trains were delayed, cancelled, missing and all permutations in between. To exacerbate matters renovations were being done at the station so information signs were not legible or hard to see. I was directed to platform 5 and when I got there was told that the train would arrive on platform 6! That was difficult because platform 6 was occupied by a train going to Gatwick. The poor platform attendant was having a hard time doing his job and trying to assist with enquiries. It also did not help listening to announcements as they were either too soft, or happened as the train was leaving. By some miracle I caught a train, and it turned out to be the right one, although it was running 45 minutes late and some stops were cancelled. I just hoped that things would be less chaotic on my way home. Later that day, on arrival at Mertsham to catch my train back to East Croydon, I found that it too had been delayed. In fact 3 trains went past while I was waiting, although had I dashed into the loo you could have bet that the train would have arrived at the most inopportune time. The trip back to East Croydon was punctuated by long pauses and the ever diminishing time left to catch my connection. By the time we arrived it was time that my connection would have arrived too, although that was unlikely as we were occupying the space it was supposed to be occupying. The ever unhelpful information boards were not being informative at all, and the poor platform attendant was being harassed by all and sundry. In the image on the left you can see two trains, in fact there were actually 4, two already occupying the platform on both sides. I could not make any sense out of this, but by chance heard an announcement that the train to Clapham Junction would now be arriving on Platform 1 and not the one where I was or where it was supposed to be. Thanks for the advance notice! I arrived at Platform 1 as said train left. In fact the “Welcome to East Croydon” sign on the information board did not help me, or any of the other people who came running down hoping to catch the train we had all missed. I decided to hang around there because it did seem as if this was where trains to Clapham would leave from, and 10 minutes later one arrived (probably 45 minutes late). Clapham Junction was like paradise after that mess, and it is unlikely I will go through East Croydon ever again, which is maybe a good thing. After the chaos of Monday, I was very tempted to stay in bed on Tuesday, but I still had some graves to find in Reading so I headed there instead. There is a First Great Western local that goes between Basingstoke and Reading, and I had had a bad experience with it early in February when the train had failed and we were stranded for almost 90 minutes at Mortimer. Surely something like that can’t happen again? or could it? The trains currently being used on that line was 150001 and 150002, a pair of 1984 BREL built prototype 3-car Class 150/0 units. 150002 proved to be the worse of the two for reliability. Both sets were in service with London Midland until 2011. 150001 entered service with First Great Western in January 2012, with 150002 to follow after refurbishment and relivery. I had travelled with 150001 and 150002 the previous week when I had been to Bramley, and thought that they were very noisy and uncomfortable compared to the usual 165 or 166 class I had used before. Their interiors were an odd purple colour and reminded me of a kitchen. Once I had completed my graves in Reading I headed back to the station, and as I arrived I kept an eye open for any new trains in the station. When we had arrived that morning I had caught a brief glimpse of something other than the usual FGW intercity HST, and I was hoping to see another. I was lucky because there was one at the platform and I quickly grabbed some pics. It turns out that this was a British Rail Class 180, and reading between the lines these were troublesome beasties. This particular one was 180 102, and it pulled out just as I headed back up the escalators. When I got to my platform I saw my train was in so I could get on board and head off home. How wrong I was! A train had broken down at Bramley and we were not going to Basingstoke unless we went via Guildford and Woking. The train just after 14H00 was cancelled, as was the one at 14H30 and the next one may have been leaving at 15H00, although that was unlikely. 150001 joined its sister and neither was going anywhere. I knew that there was a Cross Country train that used to leave Reading for Basingstoke and then onwards to Weymouth, and it left at 14H45ish, so I decided that it was a preferable option to going to Guildford so headed down the platform to see if there was anything else interesting in the station. I soon discovered another train that I had not seen before, and it was wearing a Southwest Trains livery. It turns out that these are Class 458’s, and they too were not very successful. I must admit they were not good lookers either, and during my wait I saw 8026 and 8016 in the station. Heading back to my platform I was unable to get an answer as to whether I would be able to catch the Cross Country train as the platform it normally used was currently occupied by 150002. In fact the customer service person did not know either and she dashed off to find out, just as the Cross Country pulled into Platform 8. I had never caught one of the Cross Country trains before, although had seen them quite a lot in Southampton. They tended to come and go and generally lead separate lives from the other Southwest Trains all around them. It could be that I now had an opportunity to catch one, assuming I could get to Platform 8 before it left. We all dashed across to the platform and hurriedly boarded the train, although whether it was going anywhere was another story altogether. Just then another Class 180 pulled in and I was tempted to bail out and go photograph it, but they announced that we were holding for awhile and would leave as soon as the line was clear. Bailing now would mean I would have to hang around till 15H30 for one of the 150’s to leave. Then we started to move, and I was finally on my way home, and with Cross Country too. They aren’t too bad interior wise, and they definitely were quick, but I was really just glad to finally be on my way home. Two days of train troubles in a row was asking too much. Hopefully I was done with train troubles, or had I? This morning I had to go to Southampton to see the maiden arrival of the Britannia. Would my train timings be correct? Lo and behold when I got to Basingstoke Station I discovered that the trains coming from London via Clapham Junction were delayed. The Salisbury train was running 19 minutes late, and my Southampton train was running equally late. However there was a Cross Country leaving at 10H10, and it came via Reading and not Clapham Junction so theoretically it would not be delayed so I crossed to platform 1 to catch it (followed by half the people from the platform I had just left). I arrived at Southampton in time, and by co-incidence I caught another Cross Country back home. It was kind of odd because in the two years I had been in the UK I had never been on one of these before, and suddenly in a week I had traveled on three! Maybe it is my reward for all the other train trouble I had been having this past week? So that was my week of train trouble. The moral of the story? the rail system in the UK is not perfect, it is subject to delays, and things do go wrong (and there are leaves on the line, the wrong snow and even trampolines to muck it up further). The delay at Clapham Junction was as a result of a woman threatening to jump onto the tracks, thousands of people ended up being delayed as a result. The difference is in how passengers are notified of a problem. The East Croydon mess could have been handled so much better, and I think the Reading delays could have also been dealt with a bit better, but it is really a lot to do with customer service and service levels as a rule. Lets put it like this, in South Africa they would have set fire to the train. With my time running short in Basingstoke I was hoping to grab as many of the outstanding CWGC graves in some of the churchyards between Basingstoke and Reading. The problem is that they are not easy walks, being out in the countryside and far from the stations. I had intended to grab two separate churches on this day, with a possible third depending on time and energy. I started my excursion from Bramley Station, which is the first station on the local line between Basingstoke and Reading. The train that arrived was not the usual one that I had been catching lately, instead it was a different DMU, and I must admit it was also a noisy bugger. My walk would take me to the village of Sherfield-Upon-Loddon, which was about 3,5 km away and then down the A33 to the church of St Leonards which was a further 1.6 km away, ironically in the direction of Basingstoke. My initial planning had erred somewhat as I had placed the church in the village whereas it was really quite far from the village. Navigating through the country lanes is always risky and at one point there were roadworks that really messed me around. There is a lot of water in this area too, and I kept on coming across streams and bridges, as well as the village pond. Eventually though I came to the village and had to backtrack a portion to find the church. The one good thing about my detour was the discovery of the village War Memorial, and that in itself made the detour worthwhile. I don’t mind detours if I can discover something on them, and this memorial was a unexpected bonus. Eventually I reach the A33, which was really like a mad racetrack in parts. And I walked and walked and walked until I started to question where I was going. My mapping app was not helping too much because it kept on trying to take me to the United States! But, I saw a sign ahead, and my destination was listed on it. Finally! The church is called St Leonards and it has four CWGC graves in it’s churchyard. Like so many of these old churches it is difficult to really date the building, although according to their website the church was extensively restored in the 19th century. Unfortunately as I arrived so did somebody with the keys, but by the time I had found my graves they had left so I was unable to access the building. It is quite a pretty building, with a nicely proportioned spire and quite a large churchyard that has some new burials in it as well as a lot of older ones. I also discovered that I was going to have a mud problem on this trip. I had noticed large pools of water on my walk to here, and parts of the churchyard were also wet. There was also a new addition to the church which blended in quite well, although I was not too keen on the front doors of the church, and the sign that informed that all valuables were removed from the church overnight. It is sad that things have come to this. My CWGC graves were all grouped together which made my life so much easier, and there were no private memorials that I could see in the churchyard. One last look around and I was on my way again. It had been a satisfactory visit, and the goal was achieved. In fact the day was still young and I was ready for number 2 on my list! Hartley Westpall St Mary was next on my list, it had one solitary CWGC grave in its churchyard. Distancewise I had to return to Sherfield upon Loddon via the A33, carry on for a distance and then at the Hartley Westpall sign turn turn right and continue until I found the turning to the church. It was roughly 2,5 km from the Sherfield roundabout. I had considered that I would probably be able to make one more visit after this one depending on how I felt, it really depended a lot on what I found at the end of this stretch. It was a bit of a dicey walk though because there was quite a lot of traffic, and oddly enough it was always groups of vehicles that came hurtling up behind me. The signs on the road are a bit misleading though because that really is the boundary of the village, and not the village itself. In fact I was not too sure how big this village actually was because there was so little in front of me I even had to check the satellite image to see if there were any likely targets. Eventually I reached the church, and it was a quite a small one, constructed of flint and wood, it was almost unassuming. And my war grave was easily spotted amongst the snowdrops. The church is called St Mary The Virgin and it was being cleaned so I went inside, and the woodwork nearly knocked me over. The exterior walls may be newish (although that could mean anything), but the heavy wooden beams that hold the roof up could be original and could date from 1330. Make no mistake about it, those roof beams are of the same standard as I saw on board HMS Victory. It is a solid structure, rough in its finishing, but amazing to see. You do not get woodwork like this very often. The church also has a really nice collection of stained glass windows as well as an outstanding wall memorial which would not seem out of place in a cathedral. Unfortunately the legibility of it is poor, but the artwork is museum quality. There were also a number of wall memorials to past rectors as well as soldiers, and I was very happy to see an original article about the funeral of the soldier who’s grave I had just photographed. It was really a unique memorial and the inclusion of his “Dead Man’s Penny” was an even more poignant touch. I like finding small memorials like that because they do bring a personal touch to many of the graves that I photograph. Often there is no real history to a grave, it is a name and a number with no real story behind it. Private Thomas Elliott was an individual, he served his country and he is buried in this really quiet part of Hampshire, and he is remembered in this small ancient church with the wonderful roof. I have to admit I enjoyed this church a lot, it was a really surprising building. Doing more reading about it, I discovered that there are registers dating from 1558, and considering that in 1558 South Africa had not even been discovered. It was time to leave this wonderful old place, with its beautiful woodwork and friendly atmosphere. I had a decision to make soon and had about a 1.5 km to make it in. I had decided to walk back to A33 and either go left for home, or right for Stratfield Saye St Marys. It was still quite early and while I was a bit pooped I felt like it may be worth my while to try for this church which was about 4,5 km from the turning off to Hartley Westpall. The problem was that I was unlikely to make a standalone trip out here again, and I was technically “in the area” so I decided to head in that direction. At some point I encountered that map above, and I wish I had encountered it much earlier, and had been able to take it with me to where I was going. It really laid out the area much more logically than the small screen image I was using on my phone, and if ever I do return to this area I am going to print this map out. My biggest problem came when I reached The Wellington Arms. At this intersection the A33 goes off to the right, while another road heads off to the left. Inbetween the two was a path that I was hoping to take to reach my destination. Unfortunately the path was gated off and was marked “Private Park” which meant I had to make quite a detour to get to the church which was technically on the path that I could not access. It was either go on or go home, and I had come this far already so the road to the left I did take. It was a long road. It did not have a pavement, but it was not too busy so I did not have to hop into a handy bush each time a car came. I crossed the River Loddon again, I was getting there. I reached the end of the road and was faced with more road. Where was the church? I changed to satellite view and headed towards what I thought was a cluster of buildings, but before that I saw a sign which said “to the Church”, but I could not see the church, instead I was facing a set of gates which were closed. A small sign read “No entry, access to the church only”. Aha! I was getting somewhere. Inside was all quiet, there was a largeish house on the right of the road that I was following, but still no church. I kept walking and then saw the lychgate. I had arrived! The church is called Stratfieldsaye St Mary and it has one CWGC grave in its churchyard. The church has a very large churchyard, although there were not too many graves that caught my eye. I was more interested in why was this church in this park in the first place. The churchyard was still in use too, so there must be a congregation here, it is just a pity the building was not open because there were a lot of interesting memorials inside of it. But, it was realistically time to to head off home. I had a very long walk ahead of me and frankly was not looking too forward to it. I had two choices. I could hoof it to Bramley which was 4.3 km away as the crow flies, or I could cut across to Mortimer Station which was 3,5 kms distant. In both cases the crow could cheat and take a short cut, I had no such choice. I checked my phone and Bramley was as much as 2 hours walk away whereas Mortimer was 53 minutes. I decided on the latter and set off on my epic trek across the countryside. It went quite well initially, I passed Strafield Saye House in the distance and it may be worth looking into how it ties into the church and park I had just come from. But then things began to go pear shaped as the lady in the GPS directed me to turn left onto a footpath that was only 50 metres long and which ended in a muddy field. I eventually took her advise and headed across the field, aiming for a gate in the distance (Why didn’t I take pics of this? ), then I waded through a path of mud until I hit a road and that road said “Mortimer Station.—>” and 29 minutes later I was at Mortimer Station. I had stood here for ages after my visit to Strafield St Mary not too long ago, although I was not as tired on that day as I was now. Surprisingly I only waited 6 minutes for a train. And I was home just after 3.15. Did I mention I was bushed? It had been quite a long journey, all for 6 graves. There are still more graves in that area, but I probably will not get to photograph them, which is a pity because I put a lot of mileage into getting these graves photographed. I had seen three very different churches, and seen one remnant of workmanship that left me amazed. The countryside is very pretty, although it can be wild in parts. Weather had been favourable, and for once I had not run out of battery life on my phone. There are a few lessons here that I need to learn. Preparation, navigation, information and of course proper maps and more information. Having completed this I could probably redo it in half the time, and walking much less. But that is the old hindsight thing. Basingstoke is pretty much wound up when it comes to CWGC graves now, although I still have 2 weeks before I leave here, so just maybe I shall try for those last few graves, although I really want to return to Reading Cemetery. Who knows, maybe next month you may see one more post about this area. In my quest to photograph war graves I tend to watch out for churches, and I spotted this church as I went through Mortimer Station on my way to Swindon in January. It was quite a large spire, easily seen and really worth a day trip because it was reasonably easy to get there by train, and with a spot of decent weather this morning I grabbed my goodies and headed out, catching the local between Basingstoke and Reading. The trip didn’t even take 15 minutes, and by my reckoning if I could grab my pics I could dash back to the station in time for the 11H48 train. After all, there were only 5 CWGC grave to find, how difficult is that? The church is a quick walk away and I was feeling very confident by the the time I got there. It almost feels as if the church is too big for the rural setting that I was in, although the village of Mortimer is quite a large one if you see it from the aspect of Google Earth. The church of St Mary the Virgin was built in 1869 on an old site. It is a large building designed in the early 14th-century style, and consists of a chancel, north chapel, and south organ chamber, over which is a tower. The walls are of squared rubble with external dressings and an internal facing of ashlar and the roofs are tiled. The tower is of three stages and has an octagonal stone spire.The church has a large churchyard with an additional area to the west where modern burials take place. I did a quick look around before starting my search, there was one standard CWGC headstone, but to my dismay the other 4 were all private memorials which made things a bit more complicated. The problem with PM’s are that often their inscriptions are no longer legible or they are obscured by vegetation. To make my life more complicated I was suffering from battery problems with my phone and was not able to connect to CWGC to see what other information there was apart from the names. Generally the information contained at the CWGC will include a grave number or rough location of the grave (West of church etc. ), and if you can access the headstone reports there are often descriptions of the headstone (Large cross with kerb). It is also possible to narrow down a possible area using dates, but that can be hit or miss unless the cemetery is laid out in an orderly fashion. Sometimes you find a poppy cross or a poppy wreath to make your life easier, and sometimes there are badges, regiments or corps mentioned on the tombstones. I was able to find 3 more graves using names only, although the one was more of a fluke than anything else. I was however missing one grave, and it was listed as being “north of the church” (the area to the left of the church in the image above). This area did not have too many graves, but they were not too legible, and some were totally engulfed by vegetation. This was not looking good at all. By now my train had come and gone, and the next one was due at 11H48, which left me time to find what I was after. I was carrying a spare battery for my phone so was able to do a quick change and access the headstone report which narrowed my field down to a “large cross with kerb”. There were not too many of them in this area so it was a case of checking each one. The second one I found was a possibility but the inscription was totally overgrown, I would have to come back to it after I had checked the remaining crosses with kerbs. And then I hit paydirt, a large cross which had been toppled was a likely candidate and I was able to read the name after brushing away the leaves. I had found my missing soldier! The rent was paid, I could take a few more pics then head off to the station. The church is a pretty one, as oft these country churches are, and it really has an imposing spire. It is probably much bigger than some of the churches in Basingstoke, and I would have loved to see inside of it. Along the south wall there is an area that has been paved with headstones, and I really preferred that to them being used as paths or propped up along the walls. And a last mystery was the group of headstones all on their own in one corner of the churchyard, were these non-conformists? or a family plot? I will probably never know. Then I was out the door and heading to the station. It had been quite a hunt, but I had achieved what I wanted. On my way back I grabbed a long distance shot, it was a really pretty area and I had 6 other parish churches more or less in this area that I had to get pics from. I was not sure if/when that would happen though, but I just hope that they are not as elusive as these graves were. I got to the station in time, and shortly afterwards they announced that the train had been cancelled due to a “train fault”. I could not believe it. The next train (which was actually the same train) was only due at 12H48. The same train runs on this short line that goes from Basingstoke, Bramley, Mortimer, Reading West and Reading. And if it is broken nobody goes anywhere. The station is a pretty building, but sadly the toilets were locked. And, there was nothing to see apart from the lines and the station building. I had 70 minutes to use up and I was cold and hungry. The big conundrum was that if they did not fix the train, I could be stranded here for even longer than an hour, at which point I would probably have really done my nut. I was contemplating heading to a nearby restaurant which was advertising Sunday lunch, but I was too scared to use the money I had with me in case I needed to get a taxi home. Finally, after what seemed like hours the train came around the bend before I went around the bend and I was on my way home. The moral of the story is that it is not always possible to find all the graves you are after, and occasionally you need additional information to back up your search. Not all wartime casualties are buried with a CWGC headstone on their graves, some were buried by their families, and often that family is no longer able to care for the grave which makes it all the more important that we photograph them before it is too late. Oh, and don’t think that your train will always be on time. Following on my post from Saturday when we had our first snow, I shelved the pics amongst all of my others, not thinking that 3 days down the line I would have to dust off the camera again, because overnight we had an inch of snow. I had a doctors appointment for 09H45, but by 08H30 I was on my way to Holy Ghost Cemetery in Basingstoke (my handy cemetery up the road). I was hoping to get better pics than the ones from Saturday, and I am confident in saying that I did. There was a lot more snow this time around and coverage was much better on the grass and headstones, in fact I was really happy with what I was seeing here. Even my favourite statue was looking better with her covering of white fluff. And even the grave of Captain John Aidan Liddell VC.was looking beautiful. The chapel ruins were looking spectacular too, but they look great even when it is not snowing. And the path that runs past the Quaker graves and Tank Blocks was looking beautiful, it is usually a mess with greenery, but the snow smooths that out and makes everything look so much nicer. There is a small garden just outside the cemetery which is probably meant as a place of reflection, although judging by the beer tins that usually sit everywhere but in the bin, it is used for drinking purposes. Today it was uniformly white, and not a beer tin in sight. I was hoping that the sun would make a consistent appearance, because it kept on emerging and then hiding behind the clouds. The sun would have really made the ice sparkle and make these images so much better. On my camera I have an effect called “Miniaturisation” which can give some very interesting effects when applied to some scenes. Cemeteries tend to work quite well with this effect, and I tried quite a few shots with it. I was starting to run out of time and slowly made my way out of the cemetery, shooting pics as I did. There were a lot of really great angles to be seen. So much beauty and sadness in such a small place. I worked late on Friday evening, and on my walk home (at 00H10) I thought to myself that it wasn’t too cold and the sky was very clear with a bright moon. I even took some quick pics over the wall at the cemetery as an experiment (which did not work too good btw). On Saturday morning, when I woke up I looked sleepily out of the window and it had snowed! It was white outside and definitely camera time. Granted there was not a lot of snow, but it was a nice smooth surface and after I had dressed I haphazardly headed out there. I really wanted to do a “cemetery in the snow” shoot if I was able, but I first needed a good recce on what the conditions were like outside. My intention was to go check out the local football field and see what that was like, but it turned out to be a damp squib as there was not too much coverage there. It was time to go home and grab my shopping bag and go to the shops, as I had to go past the cemetery to get there (conveniently). And of course, any useful images would help too. My flatmate said that when they had gone to the loo at 3am it had been snowing, so the fall was about 5 hours old. And the local playpark was under snow too, although it did look like people had beaten me to it, as there were tracks leading to and from the park. And then I was at Holy Ghost Cemetery. There hadn’t really been enough snow to give me the effect I wanted, but it was an interesting glimpse. Maybe another time? It is February now so anything can still happen between now and Spring. I remember seeing flurries in March 2013…..
Ok, now if somebody would just turn off the wind today. The London Bus Museum is housed at Cobham Hall in the Brooklands Museum, and I paid it a flying visit during my trip to Brooklands. As a child I was slightly infatuated with buses, or rather with toy buses, but I shall deny everything. My own experience with buses in Johannesburg I posted about in October 2012, and I expect it is rather different from the experience that people in the UK had. Still, old buses are great to see because they do not have that sleek self important look of todays eco-friendly wi-fi enabled people carriers. The first buses I saw (apart from one which I messed the pic of) was this pair, and the blue BOAC liveried one was really quite odd, I would have liked to have had a better look at her, after all, when last did you see something with BOAC on it?. The museum is next to the field where the aircraft are housed, and a line up of three generations was waiting for passengers (or munchkins?). The museum itself is in a very good condition (and free), and you just follow the arrows to discover the history behind the ubiquitous red London bus, or rather, the London bus, because not all of the London buses are red. And some were not powered by diesel either. This one was marked Camberwell, and I lived very close to Camberwell when I was living in London in 2013, and the bus service there was excellent. Fortunately the horse driven bus was replaced by the motor bus and things have never been the same since, although the pollution is very different between a horse and an engine. I suspect this one started its career as a single decker, and was modified into a double sometime in its life. I really liked the 1968 Bedford Ambulance they had on display, it carries a London Transport logo and was used as a staff ambulance at the Aldenham Bus Works. Although this interesting minimalist bus below does seem to take cost-cutting a bit too far. I expect it is some sort of driver training vehicle, or maybe some sort of big boys toy? And yes, if you are not careful they will gang up on you. It is not my intention to show every bus in the museum, that is what the museum is for, but my one gripe was that very few of the buses was open so that you could have a look at their interiors, although most buses probably look very similar on the inside. And those that I did get on board were very similar to what we had back in South Africa when I was a child. The modern London bus is a different beastie altogether, with a lot of the lower deck taken up by areas for prams and wheelchairs and lots of scowling women or people talking loudly on their cellphones. In fact I was looking through my pics and could find very few images of new buses that I took in London, although I do recall doing walking speed one rush hour on board one, and there were more buses in that street than I had ever seen at any one point in my life. What of the future? the “Borisbus” seems to be the new face of buses in London, although it does lack a certain charm and businesslike appearance. If anything it looks politically correct. I was only able to get up close to one in Salisbury and I asked at the museum whether there were any plans for acquiring one, but the reply was in the negative. It takes many years for an object to become a classic, and the red Routemaster buses in London have been classics for many years. In fact, when you think of London you think of red Routemasters rounding Trafalgar Square. Its not a bad museum, but not the sort of place to spend a lot of time in. Kinda like a bus, in peak hour traffic. Carrying on from the first part…. I was now ready to “see everything else”, because Brooklands was not only a hub for aviation, but also a hub for motor racing. It is also home to the London Bus Museum. When the track opened in 1907 it was the world’s second purpose-built motorsport track, it was also the first purpose-built banked motor race circuit in the world. There are a number of features of the old race track on the site, and it must have really been something to experience in its heyday. Unfortunately I am not a car buff, so I really did not appreciate it as much as dedicated motorsport enthusiast would. The old club house building is spectacular, although for some reason I thought it was part of the airfield. Right next to the clubhouse is the building with the Stratosphere Chamber, and this was yet another Barnes Wallis project. It is a mammoth machine, and it must have sounded even better. There were also a number of interesting aircraft engines there, including the iconic Merlin. Now if only somebody had put one of those in a racing car! The Munchkins were still following me around so I headed off to take a look at some of the classic cars on display in the Malcolm Campbell Shed. Now I must admit my dream car is probably one of those great big green open top Bentleys with large headlights. But I did see a few oldies here that I liked, that three wheeled Morgan was especially nice. There is also a display of vintage motorbikes and an interesting Raleigh cycle display. To my amusement one of the cycles on display was a Raleigh Chopper! These come from my childhood and these were THE bike to ride (and fall off from), but alas I ended up with a sensible Raleigh Rapier and was not not the doyen of the playground after all. This particular example is dated 1979 (and is probably worth a lot of money). The next time I am here this is one area I do want to investigate. The one thing about this museum is that there is a lot to see, and I had really only breezed through a lot of it. I really needed to revisit the Concorde, and investigate some of the other exhibits in the Wellington Hanger, I also missed the museum shop, and of course I wanted to take a better look at those olde racing cars and vehicles. There are also a number of period buildings on the site that are interesting in their own right, and they are worth investigating too. There were also a few olde vehicles that amused me parked outside, and if anything you could have probably have found similar ones like this in South Africa way back when. And then I was on my way, leaving this really nice museum behind. It had been a very enjoyable trip, and one which I would make again if I get the chance. The London Bus Museum pics I will paste under a separate post. Yes it is true, I will even go gravehunting on Christmas. Early on Christmas day I packed my goodies and headed off to Monk Sherborne, to photograph two more CWGC graves at the All Saints Church. It was not too far away, in fact I was not too far from Sherborne St John which I had visited on the 13th of December. My route had taken me on a bit of a detour as I was not able to use the shorter route I had researched before, but it is pretty country around here, so the view was of rolling English countryside and pretty houses. The Church is an old one, dating somewhere between the 10th and 14th century, and is built of flint with a clay tile roof. The churchyard is not a very big one and does not have as many graves as I would have expected. However, these things are deceptive because while there may be no headstones does not mean that there are no graves, or how many are on top of each other. My CWGC graves were easy to find, and once I had photographed them I wandered around the grounds. The one grave is particularly sad, as the soldier died on 26 November 1918, 15 days after the Armistice. It may be that he was a Spanish Flu victim, or died of wounds. However, the thought of going through that terrible war only to die shortly after it ends is especially sad. 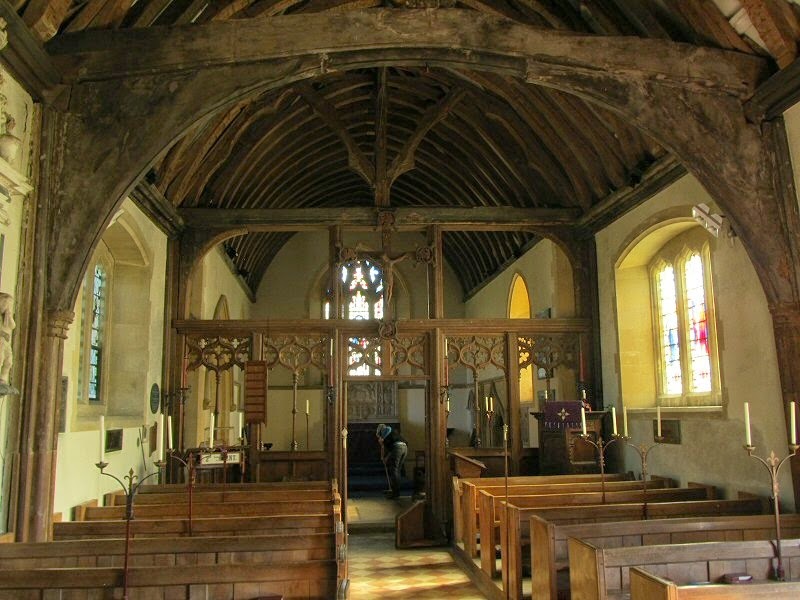 Unfortunately the church does not have a lytchgate, but there is a beautiful wooden entranceway to the church which I suspect is very old. Its a really beautifully made wooden structure, but there was no indication as to its age. Behind the church and on one side are some fenced graves, and I believe there is a very nice wooden effigy of a knight inside the church. Unfortunately though, I could not get into the church to verify if this is true. This side of the church is easier to photograph because the sun was behind me. I had completed my circuit of the grounds and theoretically was ready to head off home. There were a few graves I wanted to capture first and quickly did those before I started on my long walk home and my Christmas lunch. On my way to the church I had passed the village War Memorial, and wanted to get some pics of it, although the sun was behind the memorial, making it very difficult to photograph the inscription. I took the right hand road to get back to where I wanted to be, and that was a nice walk, punctuated only by the occasional car and grouse catching fright at my passing. I was finished with the Sherborne St John and the Monk Sherborne graves; 4 more have been photographed, and who knows where my next meandering would take me. In the meantime though I headed back to Sherborne St John to see about getting into the church, which means please follow the link to see my comments at the end of the Sherborne St John blogpost.